NEW YORK — Stocks went into a steep slide Thursday morning after Apple reported a slowdown in iPhone sales over the holidays in China, a hugely important market for the company. The rare warning of disappointing results from Apple sent a shudder through markets and reinforced fears among investors that the world’s second-largest economy is weakening. 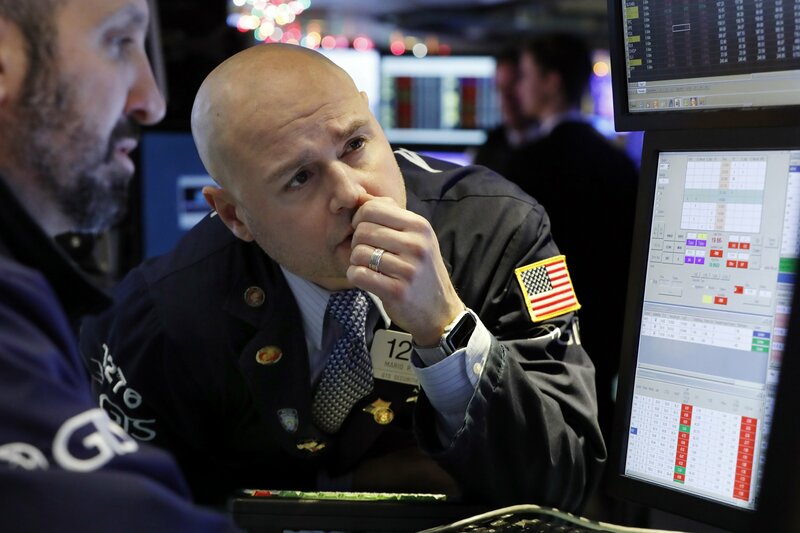 The Dow Jones Industrial Average fell more than 600 points about an hour into trading. The broader S&P 500 index was down 2.4 percent. Apple’s stock plunged 10 percent, erasing $67 billion in value. Other big exporters, including technology and machinery companies, also took big losses. Some of the worst drops were at chipmakers that make components used in smartphones and other gadgets. The U.S.-China trade dispute, nearly a year old, threatens to snarl their supply lines and reduce demand for their products. The losses deepened after a survey of U.S. manufacturers also showed signs of weakness. The S&P 500 dropped 60 points to 2,449. The Dow slid 642, or 2.7 percent, to 22,707. The Nasdaq, which has a high concentration of tech stocks, retreated 185 points, or 2.8 percent, to 6,482. Apple’s warning couldn’t have come at a worse time for stocks given the wipeout in late 2018. Many global indexes posted their worst year in a decade amid concerns about the global economy and the prospect of further U.S. interest rate increases. U.S. government bond prices, gold and high-dividend stocks like utilities all rose as investors looked for safer places to put their money. Apple stock has slumped 38 percent since early October amid fears of a slowdown in China. The company also recently announced that it would stop disclosing how many iPhones it sold each quarter, a move many investors suspected was an attempt to hid disappointing news. Apple stock had fallen to $143.58 at mid-morning. Microsoft shed 1.6 percent to $99.46. In the chip industry, Intel fell 4.1 percent to $45.17, and Qualcomm lost 2.4 percent to $56.04, while Skyworks skidded 7.6 percent to $62.77. Among big industrial companies, Caterpillar gave up 3.5 percent to $121.90, and Deere lost 2.5 percent to $144.93. Companies that make heavy machinery such as construction equipment are facing less demand as China’s economy, the largest in the world after the U.S., loses strength. They are also dealing with higher costs for metals as a result of import taxes. Markets overseas held up a bit better. Germany’s DAX and the French CAC 40 both fell 1.2 percent, and Britain’s FTSE 100 dipped 0.2 percent. In Asia, tech-related stocks suffered most. South Korea’s Kospi ended 0.8 percent lower and Hong Kong’s Hang Seng gave up 0.3 percent. Oil prices were little changed. U.S. crude stayed at $46.52 a barrel in New York and Brent crude rose 0.4 percent to $55.13 a barrel in London. Oil prices have nosedived almost 40 percent since early October, and investors’ fears about falling demand in China and elsewhere were a key reason for the decline. Some experts believe that the market volatility could eventually lead to changes in the policies that are worrying investors. The Federal Reserve, for example, could slow the pace of its interest rate increases if markets continue to drop. And President Donald Trump could become more open to settling the trade dispute with China.